Obviously, mostly every one eager to registered & expose their face in the book - Facebook, the world's top social networking site, and now there are even networking addicts who want to be in touch and check out the account, often. And here is an option for those mentioned above, where they can spend time on Facebook but simultaneously hide Facebook from others or boss. 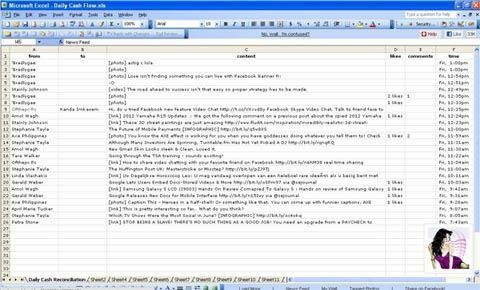 instantly see what their friends are up to on Facebook with updates appearing as new spreadsheet rows. Uploaded pictures and videos can be viewed by hovering over the entries, and users can interact by "liking" the updates with a simple click on the spreadsheet. So then how to convert your Facebook news feeds into an Excel spreadsheet? Log onto HardlyWork.in and convert your Facebook page into an excel spreadsheet. This innovative adaptation has many Facebook functions. click on 'Gimme Dem Spreadsheets,' and enter your Facebook details and you have the news feed. It just look like an excel sheet, the excel sheet is not static in nature. It has various functionalities-you can search friends, look at pictures and videos, tag friends in pictures and check your news feed. And you can see thumbnails when you move your cursor on the names.